As drones continue to grow in popularity, every drone operator has to start somewhere. You are going to crash a drone, and during the learning experience, there will be problems. It is better to start with a budget-friendly drone that can take a beating and keep on going. The U818a drone from UDI is that drone. Who Is UDI And What Do They Do? 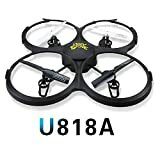 What Makes the UDIrc U818a Drone Unique? How Does the U818a Drone Compare? Flying drones used to be something out of a sci-fi movie. Then it became a military expansion that pushed us into the next generation of wartime combat. Now, drones are seen in every park and on every beach in the country. Flying a drone is a learned task, and during the learning, like riding a bike without training wheels, there are going to be crashes and mistakes. With premium drones costing several hundred dollars or more, it isn’t something you want to start with. The UDI U818a drone is an entry-level drone with a price tag that makes you feel better about the steep learning curve they come with. The rugged and durable drone allows the beginner to have a professional style drone without the worry of wasting a lot of money. This review will explore the U818a, and it’s features, lack of features and whether it is a good fit for you or not. UDI flies (pun intended) under the UDIrc Toys Inc. banner. They entered the US and European toy market and soon found a niche in RC drones and RC boats. Their primary focus is now in these two areas and conforms to US and CE standards including ISO9001. The company is based out of Shenzhen where their research and development department still resides. Over the last few years, UDI has released over a dozen drones and boats with varying success. The U818a is one of the most popular because of its ease of use for beginners and the entry-level price tag. The focus of this review will be on the U818a, though there are many other drones available by the company. They offer two ranges, each with their own lineup. The FPV series, which the U818a is a member of, and the Novelty series, which focuses on mini-drones, drones for children that light up or have animal shapes, etc. The FPV series has the entry-level to mid-range drones like the U818a. Here you will find the serious drones for beginners that are looking to start a career or a serious hobby. They can even step up staying in the same type of drone with better features or different abilities as their confidence grows. Along with the Novelty series drones, UDI is making a name for themselves in the Western markets and entry to mid-level range drones. The U818a has a lot of features that the beginner will find challenging enough to stay engaged and the mid-level operator happy. Aside from normal drone operations through the remote control, there are several flight features that aren’t as common in most other entry-level drones. The single button takes off, for example, is a great way to get the drone off the ground without having to worry about all of the physics, wind speeds and direction that a normal takeoff would entail. While the takeoff isn’t the hardest part about flying a drone, it is something a beginner can skip over until they are more comfortable flying the machine. When the comfort level is raised, the operator can take off normally, without the assistance, until they get the hang of it. The U818a is also rugged enough to take a few crashes without causing much damage. Although it is cautioned that until you are better at flying you should stay away from concrete and pavement. Flying at a grass park is preferred over a large parking lot because the harder ground is less forgiving. To help combat this, though, the U818a comes with extra propellers in the even the first set is damaged. The props are also surrounded by a sturdy guard ring that further protects them when impacting the ground. You also get to experience the flying through virtual reality. Using VR goggles with your VR enabled smartphone, you can view the flight through the VR lens as you fly around. UDI also has a mobile app that allows you to have flight controls right on your phone, instead of using the remote. You can draw flight paths on the screen, and the drone will follow along in real time. Another unique feature is the lithium-ion polymer (LiPo) battery packs. They only take about an hour to recharge and will allow the drone to fly and record for up to 15 minutes. Compare this to the six or seven minute flight times of other entry-level drones and the extra time will seem like you paid for a professional rig. Because it is an entry-level drone you won’t be paying a whole lot. You can buy directly from UDIrc, as well as a host of other online vendors like Amazon. In larger cities, generally on the West coast, you can find these drones in hobby shops and electronic stores as well as some larger toy departments in places like Sears and formerly in Toys R Us. When you do decide to purchase you can expect a wide range of prices depending on where you buy and if you opt for extras. Amazon, for example, may offer free shipping or include an extended warranty for a higher price. As a general rule, the U818a drone should only cost you between $35 and $50 for the entire kit. In the kit, you will get the drone, fully assembled and ready to go, two battery packs (which will need to be charged before the first flight), a remote control and extra propellers. For the price, it isn’t a bad deal at all for beginners, amateurs or those just curious about drones. While we never want a drone to crash and be completely disabled, if it were to happen, you aren’t going to be out hundreds, or even thousands of dollars like you can spend with higher end rigs. The price point is also great for parents trying to harbor their kid’s interest in drone flying without breaking the bank or having to settle for some rudimentary type that won’t fly well. The general public is actually quite aware of the U818a and its abilities. It has received a lot of fanfare and well-received reviews both online and in word of mouth. During the peak flying season you are bound to see at least one U818a in the air, and if you talk to the owner, he or she will probably tell you all of the good things about it. Because it is an entry-level drone, though, not all the reports are good. There are complaints about the flight paths and the controls, but those are generally released by more expert pilots that are used to complex controls with their more expensive drones. One feature that does lack, and gets a lot of complaints, is the quality of the images from the camera. Boasting shots in full HD, the actual images tend to be grainy, out of focus and without any available adjustments. To get a decent shot, you will need to hover the craft in place and make sure the controls are stead so the lens can focus. This is easier said than done, even on a machine that is geared towards easier flight controls. The flight time isn’t as great as higher priced models, though that is to be expected. Even current and past owners will agree that the over ten minutes average flight time is pretty remarkable for such a low-cost machine. Overall, the reception has been great for the U818a, and almost every purchase has been made with happy results for the owners. When put against other drones as a comparison, you will find mixed results when it comes to the U818a. It all depends on what features, or abilities you are comparing. For the overall comparison against other entry-level drones, the U818a will finish near the top almost every time. Most other sub-$50 drones lack most of the features that the U818a, or Discovery 2 as it is also known. The single button take off, landing and emergency landing features are almost unheard of in other bargain drones, and those alone are features that set it apart in most categories. When you compare the flight time and battery life to other drones of the same class, the U818a will also be very competitive. You can find drones that will last up to 20 minutes, but they will have fewer features, most of which don’t include cameras. The U818a also has several alarms that most other beginner drones leave out. You get a low battery alarm, for example, that will sound a specific tone when the drone is running out of battery life. The alert will come with enough time to get the drone back to within a safe distance where you can land it and retrieve it safely, or without a crash. It also has a proximity alarm that will alert you through a second tone if the remote signal is weak. This means that the drone is going too far away to be controlled by your remote and you will need to turn it around or lower it to a more suitable distance. Most other entry-level drones only offer a single alarm for the proximity and will rely on visual cues for battery life. This can be difficult to notice if you are watching the drone instead of the controls. Where our opinion matters are how well the drone does what it says. We take into account the price point and what is generally available for that price range. All in all the UDIrc U818a is highly recommended. That being said, you will need to understand that there are a few things to keep in mind when making your purchase. The camera isn’t as great as it is made out to be by the company. Of course, they aren’t going to tell you anything is bad with the machine because they want your business. However, flying and shooting images is a difficult and trained ability and you shouldn’t be discouraged if your pictures aren’t high quality. However, what it lacks in high definition photography it makes up for in ease of use. The controls are made as simplistic as possible while still being able to be used as a professional model. Assistance in takeoff and landing, as well as auto directional flight and hover, allow even the greenest of beginners to have successful flights right out of the box. The only real deals you will be able to find for this drone are through third party vendors. Don’t expect a lower price, though, as it is already pretty rock bottom. What you can expect to find is things such as free shipping or lowered cost in expedited shipping. Every now and again, depending on where you shop for the drone, you may be able to find a deal that includes extra parts or as part of an open box system for a lower cost. The UDIrc U818a drone is a bargain for the price and a great deal considering the features you get along with it. The ability to use your mobile phone to control the drone is a great touch and the easy to use controls make it perfect for beginners. If you decide to start with this model, you won’t be disappointed. While it may not have all the bells and whistles of more expensive models, you will get everything you need from the drone.